Globalization is not a bad idea. In fact, free global trade (which the linked post argues does not currently exist) is a wonderful concept that would improve living conditions for the majority of earth’s inhabitants and is necessary for humans to survive. However, globalization creates oddities such as the below pictures. Everything looks good, right? It’s just a City of Boston recycling bin, provided by the city to its residents so we may get our recyclables picked up once a week by the city. An overall good use of Bostonian tax dollars, right? Well I thought so too, until today. Today is our trash and recycling pick-up day. Our recycling already got picked up so I went outside to bring the bins in and while doing so noticed a curious mark on the side of the bin. 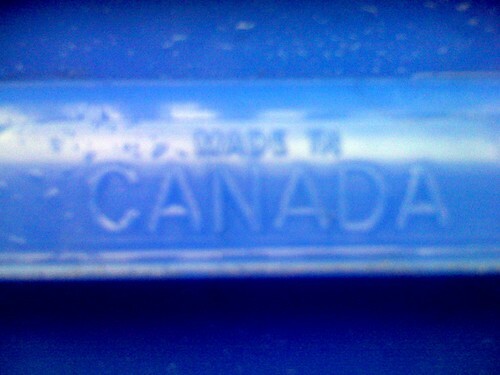 I know it’s a bit blurry to see (taken with my iPhone) but the side of the recycling bin says “Made in Canada”. 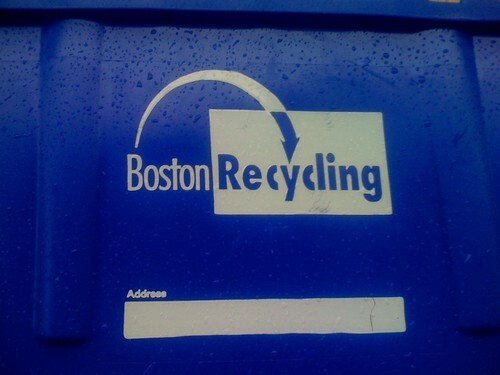 That’s right, the City of Boston’s recycling bins were made in Canada. Now, why is this use of foreign plastic bin makers such a big deal? Well, for one think of the resources required to transport all these plastic bins from Canada to Boston. It’s ironic for a program designed to improve our environment to cause unnecessary pollution by using a faraway source for these bins. Also, think of the economic benefit this bin manufacturing contract could have had to a plastic manufacture(s) here in Massachusetts. Even if the city government saved money by using the Canadian company, in the long run we lose money by it leaking out of our state economy and thus resulting in less jobs and less tax revenue. All in all, it’s not the worst thing that the City of Boston has done but it doesn’t make sense why we didn’t use a company within the state to make these bins as it would have required less resources and thus been cheaper and more environmentally friendly. Perhaps there’s something I’m unaware of behind the scenes that makes this situation logical. If any of you out there have additional facts about this story, please let me know via the comments for this post or by sending me an e-mail. Canada inst that far away from Boston, just a train and truck away. better than it coming from china. Thanks for stopping by Todd. In the grand scheme, you’re right that Canada isn’t that far away. Still, if those bins were made in Massachusetts we could have prevented a significant amount of petroleum being burned to transport all these bins to Boston. Plus, we don’t know where in Canada these bins were made. It is a big country after all and the distance from coast to coast would alter how much energy was used up during transport significantly. My thought is usually that if something is cheaper, it probably had less input of resources. Whether those inputs be material, land, labor, or transport costs. But, our roads are socialized, so…. Sometimes the extra costs of environmental action are only justified by the feel-good effect, even if they are a net burden on the environment. Your though is on point economically, though we don’t know if the bins were even cheaper. For all we know someone in power knew someone with a factory in Canada and was helping them out with a big order (would not surprise me the least bit…). In the end, we can’t say for sure which location would have best served as a manufacturing place for this bins. Making them here in Massachusetts would also release pollutants into the air, thus being worse for the environment in the state. I’ll have to send off a letter to the City of Boston agency responsible for the bins and try and get a concrete reasoning behind this whole situation. It’s strange how a place like Cambridge is labeled liberal but is almost militaristically liberal (be our kind of liberal or else sort of mentality). My neighborhood of Dorchester seems much more liberal in the literal sense than Cambridge, we have tons and tons of diversity and respect all kinds of viewpoints whereas it seems Cambridge shuns all but a certain brand of liberalism. Of course I’m biased, having lived in Dorchester the majority of my life, it’s my favorite part of Boston. I’ll work on that anon, I’ll let you know how it goes. One day I hope to become awesome like you and post anonymous comments telling people to get a life. They say I’m a dreamer but dammit anon, hope is all we have! Canada ROCKS and is CLEAN. i think adam actually DOES have a life, and thats why he cares to write about important matters such as recycling. nowhere did he say anything negative about canada except that its far away from boston. and thus, i think YOU need to get a life. Thanks for clarifying to mike, heather. I was quite confused by the pro-Canada people being so upset by this post, if anything I imply that Canada > Boston, at least for recycling. For sure you can use the idea for your paper. I’d be curious as to how it turns out, perhaps you could send me a copy? Ah, pero hablo espanol un poco. Hehe…be careful with babelfish, it’s not that accurate! I totally agree with our necessity for more self sufficiency in Massachusetts and America as a whole. Most people don’t know that Canada is the United States largest trading partner. They have considerable manufacturing capacity in many different industries, from forest products, to plastics and machinery. We import more oil from Canada than Saudi Arabia. Hi Adam – I am wondering if you ever did send that letter, and what was the response from the city? Or maybe it is posted elsewhere and I missed it? Your iphone came from China. That is a little bit further than Canada. True anon, but no one is claiming that my iPhone is environmentally friendly. A recycling box on the other hand explicitly implies environmental friendliness.